* Sen. Elizabeth Warren (D-Mass.) continues to make detailed policy proposals the cornerstone of her 2020 presidential campaign, including unveiling a new plan today on addressing consolidation in the agribusiness industry. 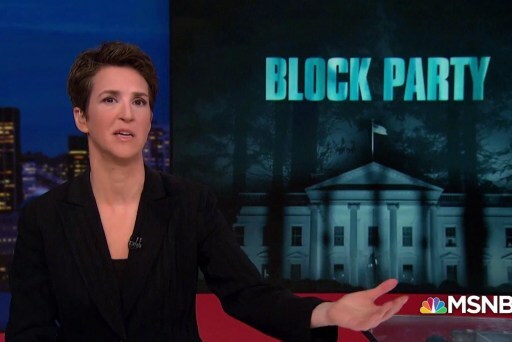 * In a bit of a surprise, Sen. Bernie Sanders (I-Vt.), a contender for the Democratic presidential nomination, suggested to MSNBC's Chris Hayes last night that he will oppose a new proposal from House Democrats to make incremental progressive improvements to the Affordable Care Act. * Though it's likely the Democratic presidential candidates will release their tax returns, Sen. Kirsten Gillibrand (D-N.Y.) yesterday became the first of the 2020 contenders to release her 2018 returns. * Ahead of a possible U.S. Senate campaign in Alabama, Rep. Mo Brooks (R) thought it'd be a good idea to read a passage on the House floor from Adolf Hitler's book, "Mein Kampf," about the utility of "colossal untruths." The right-wing congressman was apparently trying to make some kind of attack against Democrats that I didn't quite understand. * Though Rep. Steve King (R-Iowa) has generally had little trouble getting re-elected, the controversial Republican has lately been acting like an incumbent who's worried about his next electoral test. * With Sen. Tom Udall (D) retiring in New Mexico, Rep. Ben Ray Lujan (D) is now seen as his party's top contender for the seat in 2020. Lujan is perhaps best known for serving as chair of the Democratic Congressional Campaign Committee in the last two election cycles. After starting more political fires than he put out, Rudy Giuliani lowered his media profile recently, though Donald Trump's lawyer did sit down yesterday with CNN's Wolf Blitzer, who had some interesting exchanges with the former mayor. The host asked, for example, "Is there an innocent explanation why so many Trump associates were meeting with Russians during the campaign?" Giuliani replied, "It wasn't that many." 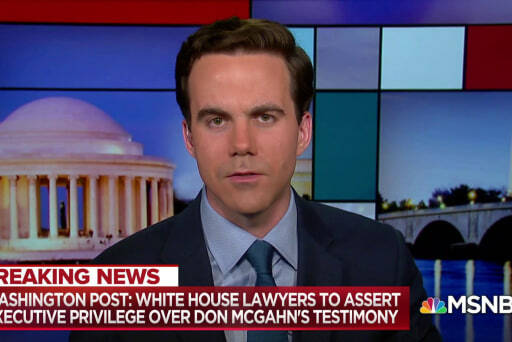 As the Republican lawyer made the comment, viewers saw on screen a list of 16 Trump associates who met with Russians during the Kremlin's operation against our elections. In the same interview, Blitzer asked why no one from Trump World reported Russian outreach to law enforcement authorities. "If a hostile adversary is coming to you and saying we have information that can help you win the election and hurt Hillary Clinton, isn't that something you should tell the FBI about?" Giuliani struggled to answer. "I have a pretty good idea of the rest of what they have. And what you're going to find out with obstruction is, this is a matter of interpretation. "There's not some new fact, some new startling fact about it, about -- you know all the facts about obstruction. You can interpret them several different ways, which is why it was a difficult question." Hmm. That's not quite what his client has said on the subject. After Hurricane Maria devastated Puerto Rico in 2017, Donald Trump was accused of passivity and disinterest in the Americans' plight. A year and a half later, we're well past the point at which the president appears to be indifferent toward Puerto Rico. He's now openly hostile and antagonistic toward the island and its residents. It's worth asking why. Also in January, Puerto Rico Gov. Ricardo Rossello sought a private meeting with the president to discuss the pace of disaster relief. Trump refused without explanation. In the past, Trump has asked advisers how to reduce money for Puerto Rico and signaled that he won't support any more aid beyond food stamp funds. At the lunch Tuesday, Trump rattled off the amount of aid that had been designated for other disaster-hit states and compared it with the amount allocated for Puerto Rico following the 2017 hurricane, which he said was too high, according to the officials, who spoke on the condition of anonymity to describe the private meeting. The number the president used was $91 billion -- a figure that appears to be wrong. 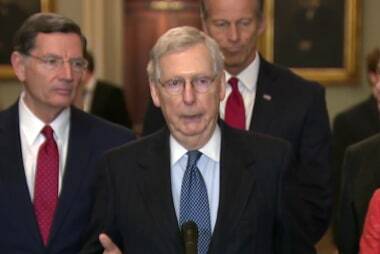 Two months after rejecting the idea of wasting the chamber's time on "show votes," Senate Majority Leader Mitch McConnell (R-Ky.) scheduled a show vote yesterday on the Green New Deal platform. The idea, of course, was to play a little political game in which Republicans would challenge Democrats to vote on an ambitious and politically provocative proposal. If Dems voted "yes," Republicans would use this for the basis of attack ads. If they voted "no," Dems would invite criticisms from the left. The Senate's Democratic minority decided not to play the pointless game and instead voted "present." Yesterday's theatrics were not, however, meaningless. The floor "debate" -- I use the word loosely -- brought into focus that Republican officials have no idea how to address the climate crisis, and don't really have a coherent way of even talking about the subject. Jon Chait added, "While this portion of the speech is extremely stupid and dishonest, it's worth noting that it is not the stupidest part of this speech. The stupidest part, in fact, comes at the end. Lee pivots from mocking the Green New Deal to insisting he does take climate change seriously, and he has a plan, a serious one, unlike the frivolous Green New Deal. His plan is for people to have more babies." "Climate change is an engineering problem – not social engineering, but the real kind. It's a challenge of creativity, ingenuity, and technological invention. And problems of human imagination are not solved by more laws, but by more humans! "More people mean bigger markets for innovation. More babies mean more forward-looking adults -- the sort we need to tackle long-term, large scale problems." I've seen the video; he did not appear to be kidding. It's been five days since Special Counsel Robert Mueller submitted his findings on the Russia scandal to the Justice Department, and if one looks past the triumphalism from Republicans and other White House allies, an awkward truth comes into focus: we know precious little about Mueller's actual report. 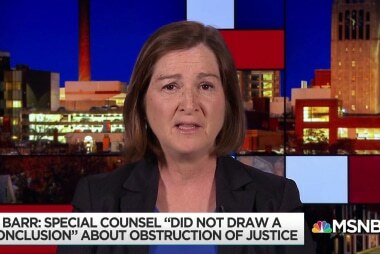 To be sure, we know what Bill Barr, Donald Trump's controversial attorney general, has summarized for us, but some skepticism is in order -- not just because of his dubious credibility, but also because his vague and brief memo left countless questions unanswered. 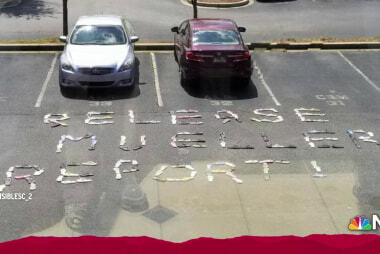 Obviously, the public is going to need to see the actual Mueller report, not the Trump administration's interpretation of it. There's evidence to suggest there's already a public consensus on the subject: Quinnipiac released an interesting poll yesterday that found 84% of Americans believe the special counsel's report should be made public. The survey results found support for disclosure across partisan, gender, education, age, and racial lines. Will officials meet the public's demands? 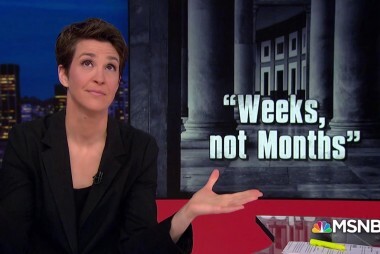 NBC News reported yesterday that the attorney general will make "a version of special counsel Robert Mueller's report publicly available in weeks, not months." Part of the problem with this is that over the course of the upcoming "weeks," the public will be led to believe the president has been fully exonerated, and that may be entirely at odds with Mueller's actual findings. ...Mr. Mueller's full report has yet to be released, and it remained unclear if it ever would be. House Democrats have demanded that it be sent to them by next Tuesday, but the Justice Department outlined a longer schedule, saying that it will have its own summary ready to send to lawmakers within weeks, though not months. Wait, what do you mean "its own summary"? Americans learned late Monday night that the Trump administration has a radical new health care position: it wants the courts to not just strip protections from Americans with pre-existing conditions; the administration also wants the courts to destroy the Affordable Care Act in its entirety. In terms of real-world impact, the Trump administration, unable to pass a reform law of its own, believes judges should help Republicans take coverage from tens of millions of Americans, and take critically important health care benefits from tens of millions more. It's against this backdrop that a reporter asked Donald Trump what his message to families concerned about what he might do to their health security. "Let me tell you exactly what my message is: the Republican Party will soon be known as the party of health care," the president responded. "You watch." Even by 2019 standards, this was odd. Indeed, former U.S. Solicitor General Walker Dellinger responded to the Trump administration's newest court filing on the ACA as both "legally indefensible" and "politically insane." Any chance some rogue cabinet officials screwed this up? If Politico's reporting is accurate, no -- because the gambit was the White House's idea. The Trump administration's surprising move to invalidate Obamacare on Monday came despite the opposition of two key cabinet secretaries: Health and Human Services Secretary Alex Azar and Attorney General Bill Barr. Driving the dramatic action were the administration's domestic policy chief, Joe Grogan, and the acting director of the Office of Management and Budget, Russ Vought, according to three sources with direct knowledge of the decision. Both are close allies of White House acting chief of staff Mick Mulvaney, who helped to engineer the move. There is a degree of irony to the political circumstances: many assumed Democrats might try to change the subject away from Special Counsel Robert Mueller's investigation following the release of Bill Barr's memo. Instead, it was Trump World that changed the subject -- and started a fight Democrats are eager to have. On Sunday afternoon, after Attorney General Bill Barr released his summary of Special Counsel Robert Mueller's report, Donald Trump and his team were thrilled. Soon after, however, someone close to the president raised the prospect of the Republican being a little too pleased. One White House correspondent spoke to a Trump adviser who noted the president's tendency to screw things up for himself when confronted with good news. There was a real possibility, the adviser said, of Trump "overreach." With this in mind, the president traveled to Capitol Hill yesterday to speak with Senate Republicans, and Trump chatted briefly with reporters before the private meeting. One started to ask the president about the Barr letter, when Trump interrupted. "The Mueller report was great," he said, referring to a document he has not read. "It could not have been better. It said, 'No obstruction. 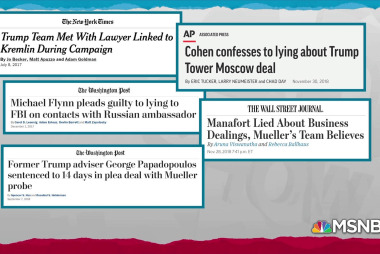 No collusion.'" As best as we can tell, he was lying. We may not know much about Mueller's findings -- we're relying on characterizations from Trump's handpicked attorney general -- but we know this presidential description of the unseen report is wrong. But that wasn't the only exchange of note. Q: Mr. President, you're accusing the people who launched the investigation into your campaign of treasonous acts. How high up do you think it went? TRUMP: I think it went very high up. I think what happened is a disgrace. I don't believe our country should allow this ever to happen again. This will never happen again. We cannot let it ever happen again. It went very high up, and it started fairly low, but with instructions from the high up. This should never happen to a President again. We can't allow that to take place. Q: Mr. President, do you think it reached the West Wing of the Obama White House? TRUMP: I don't want to say that, but I think you know the answer. And to think people close to the president were concerned about "overreach." * 14 Republicans broke ranks on this one: "House Democrats on Tuesday failed to override President Donald Trump's veto of a measure to repeal his emergency declaration on the southern border." * Green New Deal: "The Senate on Tuesday failed to advance the Green New Deal, the ambitious plan to combat climate change proposed by Democratic Rep. Alexandria Ocasio-Cortez, after what Democrats said was a politically-motivated show vote. The measure, which needed 60 votes to clear a procedural hurdle, failed in a 0-57 vote, with 43 Democrats voting present." * Keep expectations low: "The Supreme Court did not appear ready to put constraints on partisan gerrymandering after oral arguments in two cases Tuesday, as conservative justices aired concerns about how judges would decide when politics weighed too heavily in drawing congressional maps." * Climate crisis: "Global energy experts released grim findings Monday, saying that not only are planet-warming carbon-dioxide emissions still increasing, but the world's growing thirst for energy has led to higher emissions from coal-fired power plants than ever before." * Judge Edith Brown Clement: "Fifth Circuit judge does her best Trump impression in opinion attacking liberal colleagues." 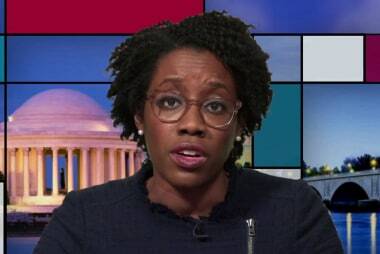 * Eyeing incremental progress on health care: "House Democrats are rolling out a plan to strengthen the Affordable Care Act that would expand federal insurance subsidies and reverse the Trump administration's attacks on the health care law -- but avoids the party's internal fight about more ambitious proposals to extend health coverage." 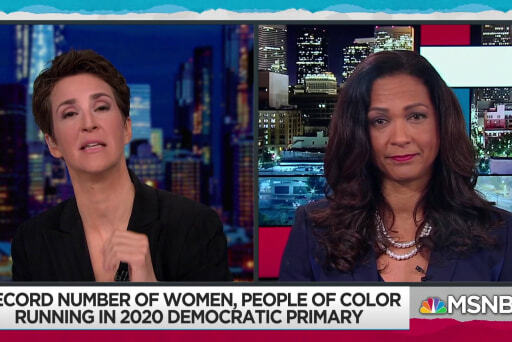 Donald Trump's 2020 campaign has some thoughts on who should -- and shouldn't -- be interviewed on television news programs. Axios's Jonathan Swan obtained a copy of a memo being sent from the Trump campaign to "television producers," a group identified with no further specificity. The memo quotes six individuals, four of whom are serving Democratic politicians, making claims about the existence of evidence of collusion between Trump's campaign and Russia. "Moving forward, we ask that you employ basic journalistic standards when booking such guests to appear anywhere in your universe of productions," the memo reads. "You should begin by asking the basic question: 'Does this guest warrant further appearances in our programming, given the outrageous and unsupported claims made in the past?' At a minimum, if these guests do reappear, you should replay the prior statements and challenge them to provide the evidence which prompted them to make the wild claims in the first place." The obvious criticism of a memo like this is the breathtaking irony. If "basic journalistic standards" require news programs to steer clear of prominent figures who've been caught making misleading claims, Donald Trump and many of those in his immediate orbit would struggle to ever reach the air. The president, in particular, has been caught peddling literally thousands of false or misleading claims. But that's not what I see as the principal problem.